The 25.51 metre sailing yacht Enso has changed central agencies and is now listed for sale by Alastair Shove at Carrswood Yachts. Featuring naval architecture and exterior styling by Rob Humphreys Yacht Design, Enso was built in GRP by British yard Oyster Marine and delivered in 2016 as an 825 model. Her owners were looking to replicate the levels of comfort and wellbeing that they are accustomed to on-shore. To that end, Enso has been fitted out with extensive air conditioning and an advanced water purification system. What’s more, additional shielding was added to her electrical cabling to minimise electromagnetic field transmission. Accommodation is for nine guests, with a master cabin, two convertible twin cabins and a pipecot berth, while the crew quarters are suitable for a staff of up to four aboard this yacht for sale. 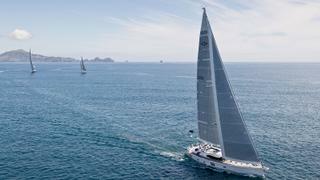 Enso’s 3Di Endurance sails were created by North Sails, while her in-boom furling carbon rig is courtesy of Hall Spars. A combination of captive and deck-mounted winches offer hydraulic sail handling, while auxiliary power comes from a single Cummins QSB5.9 diesel engine. With a 6.31 metre beam and a maximum draught of 3.43 metres, she displaces 56 tonnes. Lying in Palma, Spain, Enso is asking £4,100,000.